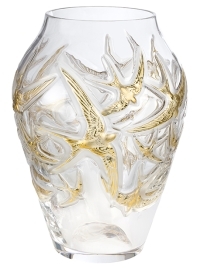 Lalique recently celebrated their 130th anniversary in a big way with a gorgeous new crystal collection inspired by swallows entitled the Hirondelles collection. Hirondelle means swallow in French and this captivating crystal collection features our feathered friends in gorgeous fashion throughout the collection. The collection consists of numerous items including sculptures, vases, lamps and other related items with the centerpiece of the collection being the exquisite Hirondelles grand vase which you can see to the right. The Hirondelles grand vase was limited to an edition size of only 130 pieces, making it very exclusive and highly coveted. The Hirondelles collection is produced by Lalique’s finest artisans and their craftsmanship is evident in the beauty and precision of every crystal piece. Swallows of course were a recurring theme in the work of founder René Lalique and this beautiful collection is truly a testament to his artistic vision and legacy! Lalique was founded in 1888 and the brand continues to thrive in today’s competitive decorative crystal market thanks to the unique allure, artistry and exquisite quality of their creations. Browse the wonderful selection of Lalique Hirondelle and swallow themed crystal for sale on eBay. You won’t find a better selection anywhere else!